At Le Domaine de Fontenelles you get a choice of comfortable, terraced houses, villas and apartments. The houses have a terrace with garden furniture and views of countryside or the golf course. The villas have a spacious private garden with private pool. Most can be heated for an additional fee. The apartments have either a terrace or a balcony. The interior of all types of homes can vary slightly. \t Semi-detached cottage for 4 to 6 people (FR-85220-15), for 5 persons (FR-85220-21) or 6 persons (FR-85220-16, sometimes with a balcony on the 1st floor). All have a luxurious living room with French patio doors to the terrace and/or garden and a complete open kitchen. Apartment FR-85220-15 has two bedrooms. Both feature a double bed or two single beds. Accommodation upstairs is on a mezzanine with a double sofa bed. There is a bathroom with bath or shower and there is a separate toilet. Apartment FR-85220-21 has two bedrooms. Both feature a double bed or two single beds. Accommodation upstairs is on a mezzanine with a single bed. There is a bathroom with a bath or shower and there is a toilet (usually separate). Apartment FR-85220-16 has 3 bedrooms. All are equipped with a double bed or two single beds. There is a bathroom with a bath or a shower and there is a separate toilet. Upstairs is a 2nd bathroom with shower and a 2nd separate toilet. 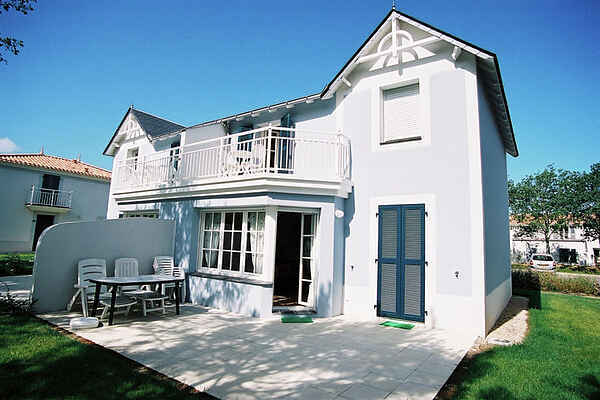 Detached villa for 6 persons with an area of approx. 86m2 (FR-85220-17), for 6 people with an area of approx. 100m2 (FR-85220-18, ground floor) or for eight people (FR-85220-19). In the fenced garden, you have use of the terrace with private pool. Villa FR-85220-17 and FR-85220-18 both have three bedrooms. All are equipped with a double bed or two single beds. Bedroom one has French patio doors which open to the garden. There is a bathroom with bath or shower and there is a separate toilet. At Villa FR-85220-17, bedrooms 2 and 3 are situated on the 1st floor. Villa FR-85220-18 is on one level. There is a 2nd bathroom with shower and a 2nd toilet. The villas of type FR-85220-17 have a balcony on the first floor. Villa FR-85220-19 has 4 bedrooms. Bedroom 1 has French patio doors. All bedrooms feature a double bed or two single beds. There is a bathroom with a bath or a shower and a separate toilet. Bedrooms 3 and 4 are upstairs. There's a second bathroom with a shower and second toilet. Apartment for 2 to 4 people (FR-85220-20). The living room has been furnished with a double sofa bed and French patio doors which open to the terrace or the balcony. There is a complete open kitchen. There is a bedroom with a double bed. There is a bathroom with a bath or a shower and there is a toilet (usually separate).